Raclette from the Good King Tavern. The Good King Tavern has settled into a fine Gallic groove over its five years at the corner of Seventh and Kater Streets and has grown into a cozy, intimate neighborhood French bistro for Bella Vista. The steak-frites are superb (especially the frites). There’s a duck du jour that alternates between variations on duck confit and a spontaneous riff on perfectly roasted juicy breast from Keiser’s Pheasantry in York County (lentils, bacon, and dates on our visit). There are the irresistible socca pancakes made from chickpea flour that signal the Provencal roots of father-daughter owners Bernard and Chloe Grigri. Chloe also has curated a somewhat under-the-radar but very worthwhile wine list that focuses on natural winemaking from France and delivers a selection served with fair value, from both “good, better, best” glass options to “Keep Wine Weird” Sundays, which offer pours of hard-to-find oddities like Tim Wildman’s Astro Bunny pét-nat and a vermentino-nero d’Avola-zibbibo blend from Australia. Sundays, it turns out, are an all-around good night to visit the Good King. 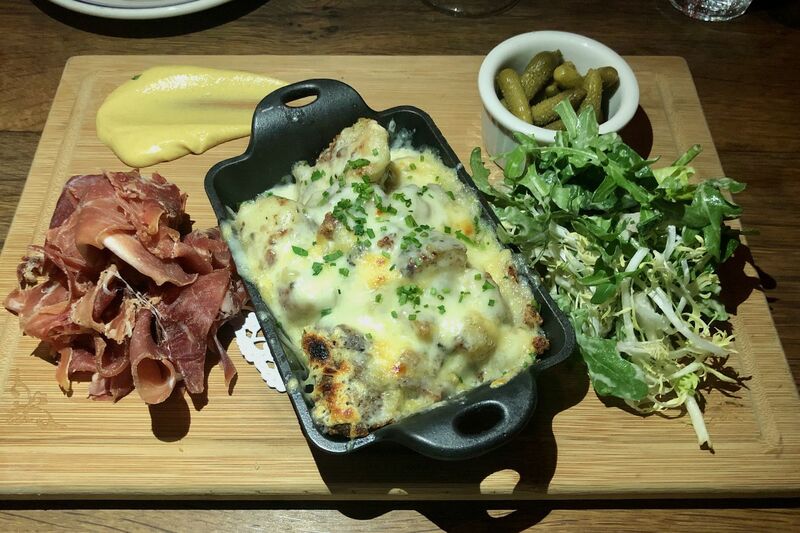 The showstopper at our recent meal was the hot steel crock of Sunday Raclette, billed by manager Patrick Bruning as the bistro’s Savoyard reply to Italian Sunday Gravy. That means potatoes, melted cheese, and spicy mustard on a board at the center of the table for sharing. But what made it especially good were all the details. The Yukon potatoes were carefully salt-roasted before they were crisped up with olive oil, shallots, and garlic. The raclette, a classic French alpine oozer, was broiled to a crispy brown. There was spicy Dijon for dipping and peppery greens of frisee salad in a bright vinaigrette to help cut through all that richness. As a bonus, a generous portion of jambon de Bayonne was mounded on the side, the salty pink folds of this cured ham from Southwest France (slightly thicker cut and moister than Italian prosciutto), pushed this snack board closer to light meal status.